Middleton began preparing for the arrival of EAB with the adoption of a written plan and completion of an ash tree inventory in 2009. 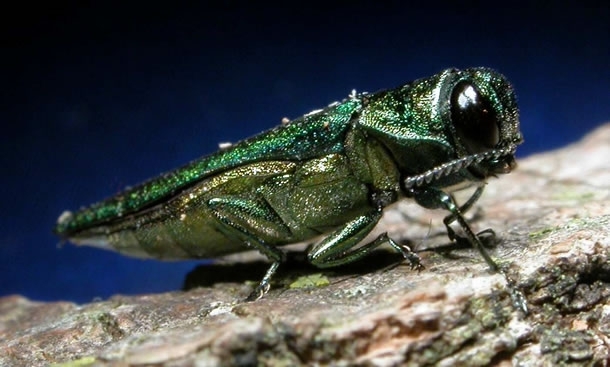 On Monday, May 19, the presence of the Emerald Ash Borer (EAB) was identified and confirmed in the 6900 block of Cooper Avenue in the City of Middleton. An employee from the USDA Animal and Plant Health Inspection Service was conducting pest surveys and notified the WI Department of Agriculture, Trade and Consumer Protection and the City of Middleton City Forester. Officials from the Wisconsin Department of Natural Resources made the final confirmation. Middleton now joins a growing list of Wisconsin communities where the insect has been detected. Dane County has been under an EAB quarantine since the borer was found in the City of Madison in November of 2013. Materials regulated under the EAB quarantine include all hardwood firewood; ash products such as timber, pallets, mulch and trimmings; and ash nursery stock. Businesses that deal with these products can apply for a variety of certificates or exemptions that are not available to the general public. Residents should be aware that it is illegal to move firewood out of the EAB quarantined area, as it is the primary means for the EAB to spread. It is best to keep firewood onsite. Middleton began preparing for the arrival of EAB with the adoption of a written plan and completion of an ash tree inventory in 2009. Over 2,500 ash trees were identified on public right of ways and parklands. Pre-emptive removal of ash trees was started in 2010. Over 600 ash trees have been removed and more than 500 new trees of other species have been planted in place of the ash trees. Most of the removals and plantings have been done by City staff. No treatments have been conducted due to the overpopulation of ash trees in Middleton. When the total number of ash trees is reduced to 10% of the overall street tree population, a re-evaluation of treatment options and management approaches will be conducted for possible inclusion into future management. If a resident would like to pay for treatment of a tree in the public right of way, they should contact the City Forester at 821-8345. Residents concerned about the health of their ash trees should consult with professional arborists or tree care specialists. A list of certified arborists for hire can be found at: www.waa-isa.org/arborists/search.asp.